Back in 2009, some musicians met together at Mayhem Festival. They agreed that they would do an album together and there were a lot of rumours surrounding it. Things remained quiet until about 3 months ago when the first news of the project started spreading. 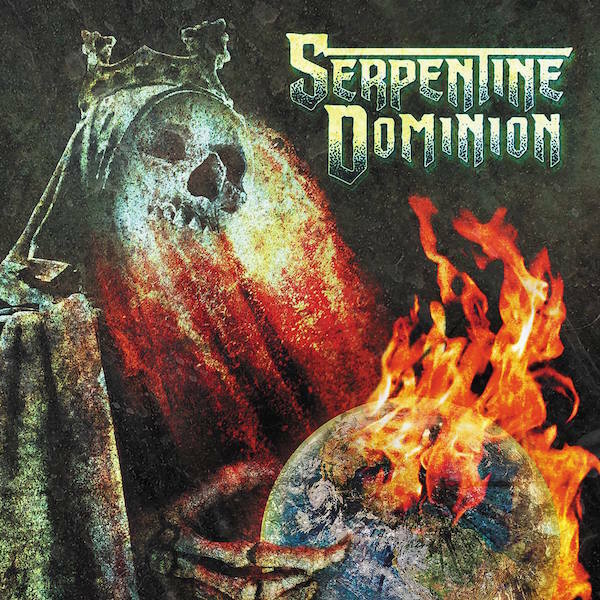 Featuring members of Cannibal Corpse, Killswitch Engage and Ex-Black Dahlia Murder; this is Serpentine Dominion. Whilst the acoustic guitars of “Intro” are not what was initially expected, they give way to rather impressive layered guitar melody filled with speed and technicality. It’s very different to what Dutkiewitz is known for, yet he manages to weave everything together expertly. The first single of the album is where we first get to hear Corpsegrinder delivering his usual style of harsh vocals. Mixing it in with the backing vocals of Adam, the song can be described as “an uparalleled cocktail of vengeance”. “Vanquished Unto Thee” and “Sovereign Hate” take things in a slightly different direction with their clean vocals alongside the harsh vocals, yet it somehow feels familiar. Machine gun fire drums and low tuned guitar riffs dominate “On the Brink of Devastation” which features harsh vocals from Adam alongside the harsh vocals of George. Whilst it doesn’t sound like it should fit, it does due both of them being at different pitches. With it’s thrash metal style to it, “Jagged Cross Legions” has a very similar sounding riff to “Murder Worship” from Kill[Cannibal Corpse]. It’s different enough with it’s higher speed and lower tuning, but hearing corpsegrinder over it does make you think that you might be listening to a Cannibal corpse song. Slowing things down and showcasing the return of the acoustic guitars, “Prelude” with its finger picked melody makes for a nice interlude from the chaos that reigned on the previous tracks. Keeping the slower tempo explored in the previous track, “This Endless War” brings the entire album to a close in expert style with the usual clean and harsh vocals that are commonplace across the album. Even though the album features clean vocals and some excellent performances from the trio, it does feel a little bit safe. They could have done to have experimented a little bit more and not stuck with the same ‘million miles an hour brutal death metal’ theme that has been done to death. Standout tracks: Vengeance in Me, Sovereign Hate, On the Brink of Devastation, This Endless War. Serpentine Dominion’s self-titled album is out now via Metal Blade Records. You can read a recent interview with Shannon Lucas here.